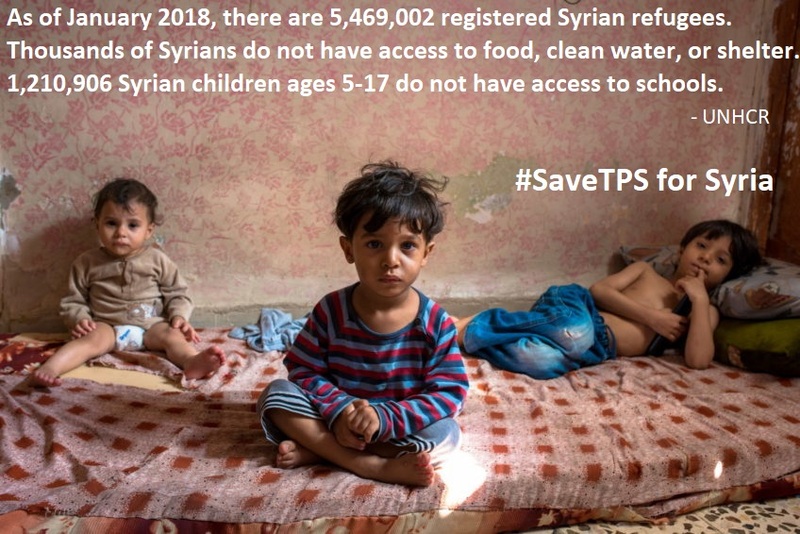 The American-Arab Anti-Discrimination Committee (ADC) needs your help to support the extension of Temporary Protected Status (TPS) for Syria. ADC has been at the forefront in the fight for TPS for Syria, as well as other countries. Seven years of civil war and entrenched violence has destroyed the lives of hundreds of thousands of children and families in Syria. Violence with impunity, persecution, intimidation, detention, torture and gross human rights violations continue to plague Syria. Nearly three million Syrians still live in areas the UN defines as besieged or “hard to reach” and an average of 6,550 Syrians per day were displaced from their homes in 2017. This is a humanitarian crisis that warrants the United States to redesignate TPS for Syria, and stand for humanity, dignity, and respect. Over two dozen U.S. Senators including Senator Sherrod Brown and Senator Jeff Merkley support TPS redesignation and extension for Sudan, Syria, Somalia, and Yemen. 68,000 TPS recipients came to the U.S. as children, and roughly 273,000 U.S. born children have a parent with TPS status. Because TPS recipients do not have traditional immigration status, they are held hostage to the whims of the Trump administration.